Height 5 feet 5 inches. Weight 122 lbs. Chest measurement 32-35 inches. Complexion fair. Eyes grey. Hair brown. Sight normal. Hearing good. Colour vision normal. Limbs well foormed. Full and perfect movement of joints. Chest well formed. Heart and lungs normal. Teeth good. Free from hernia, varicocele, varicose veins, haemorrhoids, inveterate or contagious skin disease. No vaccination mark. Good bodily and mental health. No slight defects. No distinctive marks or marks indicating congenital pecularities or previous disease. .
Arthur Watson was the son of late James (stepfather) and Annie Watson. He was born Arthur David Pankhurst Cattle in 1891 at Reefton, the son of Phoebe Annie Cattle. Annie Cattle married James Watson in 1892 and had two more children - James born in 1895 and Annie Marion born in 1902. Arthur was still living in Greymouth in September 1912, where he was a linotypist when he witnessed an assault about nine o’clock one night. Arthur's brother James Watson was living in Timaru, and was his next-of-kin - Mr James Watson, Alexander Street, Greymouth, and later of 16 Cliff Street, Timaru. In 1914 Arthur was a printer in the Linotype Department of the Timaru Post Company. He had already registered for compulsory military training at Greymouth. From the Territorials, he enrolled and passed the examination on 12 August 1914, in a very lively and busy Drill Shed; he was not one of those rejected because they were over age or under age, insufficiently developed, had no experience, or were overweight (the regulation weight was 12 stone). In fact, Arthur was in good health and one of the few with good teeth. He was amongst the earliest volunteers in Timaru, responding to the call to arms like a true patriot, and ready to go with the infantry contingent from the South Canterbury district in mid August. The South Canterbury infantry arrived in Addington Camp on the night of 17 August and quickly settled down in the quarters prepared for them. He embarked for the Front on 16 October 1914. Thereafter there is no mention of Arthur until after his death on 29 April 1915 when he was killed in action at the Dardanelles. News of his death would be received in his native Greymouth with genuine sorrow. He was of a bright, cheery disposition, an unassuming young fellow, very popular among his fellow employees, and was well liked by the many friends he made wherever he went. Arthur was highly esteemed by his employers and companions in the office of the “Post”, and the news of the death of their “boy” at the Front caused deepest sorrow. His death was noted, in February 1916, in the twenty-seventh annual report of the Canterbury Typographical Association, of which he had been a member. As late as 18 May 1915 the mail from Egypt had brought letters and cards from the late Private Watson to his personal friends in Timaru. Another fine young life lost too soon. When the medals were to be sent, it was to James Watson, his brother, at Elizabeth Street, then of Brown Street, and finally of 16 Cliff Street, Timaru. A communication to Expeditionary Force Records Branch, Head Quarters, N. Z. Military Force, Wellington, dated 24 May 1916, says that it "appears he (Arthur Watson No. 6/571) was an only son and that both his parents are dead, but that he has a step father living and also a half brother and two half sisters. There is about 60 pounds belonging to him in the Post Office Savings Bank, and there is probably some allotment of pay due to him." His stepfather was residing in Greymouth when Arthur was killed. There is no indication whether the accompanying questions were answered, e.g. the name and address of nearest of kin of the deceased, whether any will made. 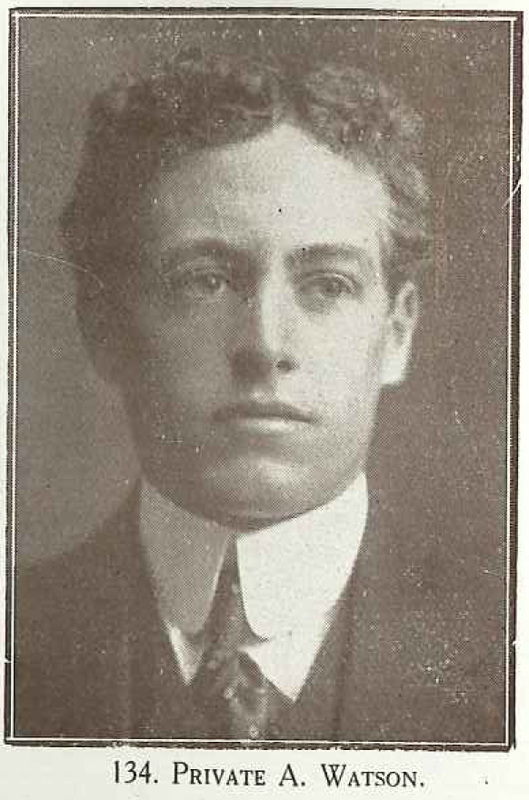 The Public Trust administered his estate early in 1917, after publishing a notice in the Timaru Herald of 13 November 1916, regarding the "Estate of Arthur David Pankhurst Cattle, commonly known as Arthur Watson, of Timaru, Linotype Operator, but at his death a soldier on active service". The value of his estate was £105.18s.7d, consisting for the most part of cash in the bank – a good return from a young man. Arthur's mother died in 1903 and his step-father in 1917, both at Greymouth. His step-father’s assets included a share in the estate of A. P. Cattle. His half-brother James also served in World War One (service number 73028), enlisting in 1917 at Greymouth. His next-of-kin was his sister Annie, residing at Mount Magdala Home at Christchurch. He was discharged in 1919 and intended to return to Cliff Street, Timaru. James died in 1950 at Timaru.